Looking for a metal door or an architectural commercial door supply? Jersey Architectural Door & Supply Co. has you covered. Located in Atlantic City, New Jersey; we are a door and window distributor offering a wide selection of commercial doors to businesses and commercial project managers throughout the nation. Stop by to browse through our complete line of commercial specialties to find the right commercial door that matches your projects vision. Once chosen, visit our installation division, where our eight factory-trained union carpenters from Local 623 await to schedule your installation. When New York, Pennsylvania and New Jersey Metro business think commercial doors, they think Jersey. We’ve been supplying the Tri-State area and the nation with top quality commercial doors for nearly a century now. As a company, we’ve earned a sterling reputation as an industry-leading door supply house by always listening to our clients. We care deeply that our business partners get the right door for the job. And if a client decides to use our in-house factory-trained union carpenters for an installation, we can guarantee our installers get it right the first time. 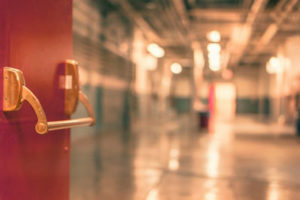 From burglar-resistant door, to hurricane and tornado-rated doors, from energy-efficient rated doors to intricate hardwood doors, Jersey Architectural is the one-stop-shop for quality commercial door supply and installation. We stock swinging and sliding doors, revolving doors, handicap-accessible doors, automatic doors and glass doors as well. Our in-house team of architects can answer any questions you might have about commercial doors. Our company has always been dedicated to listening to clients’ needs, and working within their budget to decide on the best commercial door solution. We are available for construction consulting at our Atlantic City headquarters, or by calling us at (609) 345-0174. The front door to a business is possibly the most important of any commercial building. Jersey Architectural understands how a new, handsome, masterfully crafted metal or wood door can help attract customers and make a powerful statement about a business’ quality. Jersey Architectural is a family-owned business that strives to provide the highest quality commercial door supply and installation service to every client, from mom and pop shops to large urban companies. We supply and install everything from individual doors for one-room shops to huge door orders for new large urban constructions. Though we pride ourselves at offering top notch doors, Jersey offers more than that. We give our clients peace of mind that they are dealing with a family-owners business with nearly 100 years of experience working in the door supply industry. And just as we supply door orders of all different sizes, we also do installations of everything from a single exterior swing door install to fitting an entire commercial building with interior and exterior doors. Have More Questions About Our Commercial Door Supply And Installation Services? We have on site design and architectural services. We have served many large corporate partners as their door and window company for decades. Looking for a trusted source for your commercial building project? We serve the entire region. Contact us to give your business a fresh, new look with one of our commercial doors.